NEWLY LISTED! WATERFRONT! PRIVATE DOCK! Close to the Roche Harbor! Kingfisher Waterfront Paradise! NEWLY LISTED! WATERFRONT! DOCK ACCESS! Close to the Roche Harbor! 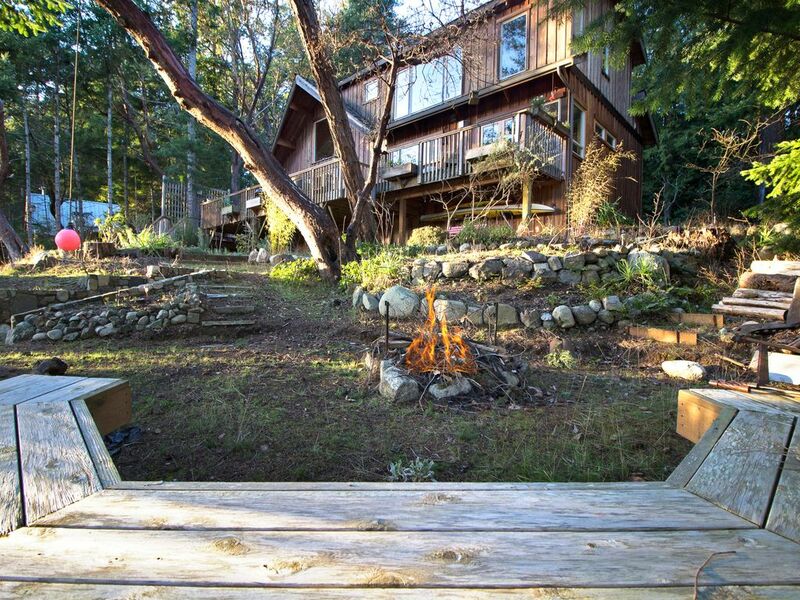 Peaceful, waterfront house with dock nested in a half acre of fir and cedar forest on Davison Head is a haven of natural beauty and tranquility. From the cedar deck overlooking secluded Neil Bay you can hear the sounds of bald eagles, blue herons and kingfisher. A pleasant 15-minute walk will take you to Roche Harbor Marina and Airport where you can enjoy a grocery store, shopping and award-winning dining. The house is a 20 minute drive from the ferry terminal in Friday Harbor. This over 4000 square foot home offers a warm ambiance with its cedar log construction and cherry hardwood floor. The open floor plan and stunning waterfront views leave guests in awe as they enter the home. The gourmet kitchen with open fir cabinets is a welcoming area to enjoy the local produce and seafood bounty from the island. The living room is a sunny area for reading or a short nap after an island bike ride. A separate room contains the HD TV and gas fireplace for the cooler evenings. A master suite upstairs has a king sized bed, walk-in shower and bath tub with a magnificent water view. A second guest bedroom upstairs has a queen-sized bed with a private bath and shower. The third bedroom on the main level also features a queen sized bed with an adjacent bath and combination bathtub/ shower. There is one additional bathroom on the main level that also has a walk-in shower. A spacious daylight basement has a game room including a pool table/ ping-pong table, card and foosball table. Just outside is the path to the private floating dock where a multitude of water activities can be enjoyed, including kayaking, canoeing and standup paddle boarding. Finish your day on the lovely cedar deck overlooking Neil Bay as you enjoy an outdoor barbeque dinner among friends. The seabirds and wildlife will be sure to ease you into the relaxing island lifestyle. This house is not for parties or large groups. We had a lovely time and the property management team was exceptional. They called twice to see how we were doing. They left lights on for when we arrived. The house was clean, homey and inviting. Kingfisher Waterfront Paradise is a lovely home, and we are thrilled that it was enjoyed by everyone! We'd love to host you again in the future! Our vacation rental experience was GREAT!! The view to the water was special. Working in the kitchen was a delight. The art work added to the positive atmosphere. We had a great stay. Two really nice master suites, plus two nice smaller bedrooms. All the bathrooms were nice. Kitchen was nice and well organized and stocked. Great view of the water from the main living area. Close to Roche Harbor, the sculpture park, and the alpaca farm. We loved this home it was so warm and inviting. The thing we enjoyed about this house is you could tell it was a home. The kitchen looked out on the water and had everything a cook would need. We all enjoyed cooking evening dinners and then sitting at the dinning room table before a night of cards and good coversations. It was a prefect place to have our annual reunion. The five of us enjoyed our time at Kingfisher. Such a nice touch to have fresh flowers on the table when we arrived. We woke in the morning to an otter having a grest time swimming off the pier. Three small deer visited regularly. We loved lunching on the deck overlooking the water. The home comes with everything you need. The location is perfect with groceries and dining options within minutes in Roche Harbor. You will love your time there.